Andrew Friedman’s oral history in the more and less reliable voices of the American who cooked it. Daniel Boulud is not an American chef, but he’s a chef star in America. Many of the ambitious Americans telling their tales in Andrew Friedman’s new book passed through his kitchens. With typical Bouludian energy and hospitality, he offered to host a late-night cocktail party for chefs and restaurateurs to celebrate the publication of Friedman’s Chefs, Drugs and Rock & Roll at Les Pleiades, his bar opposite Cafe Boulud in the Surrey Hotel. 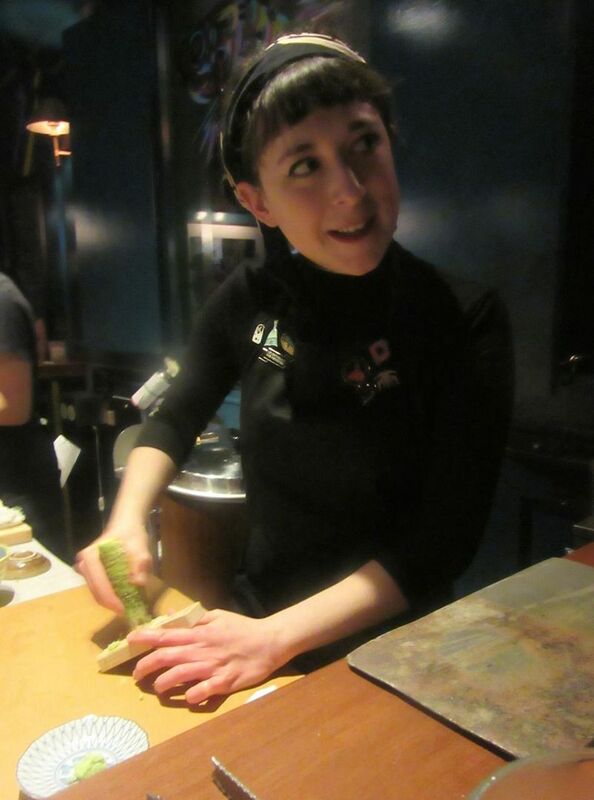 At midnight, chefs, partners, and chef synchophants gathered in rear of Bar Pleides to toast the host. 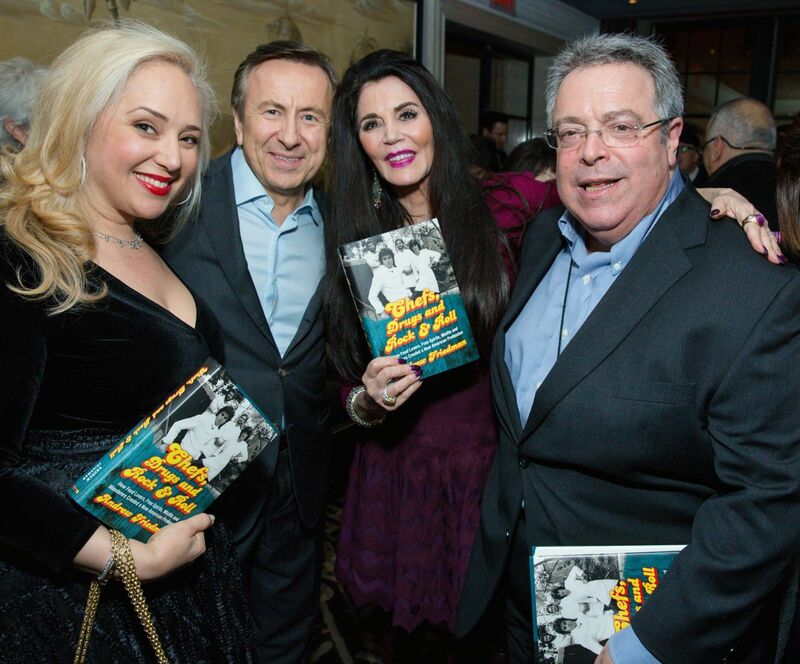 The book is an oral history of the “food lovers, free spirits, misfits and wanderers” of the ‘70s and ‘80s “who created a new American profession.” It’s the thirtieth book by Friedman who described his writer’s block and insecurity in a recent, depressing blog. Imagine if he didn’t suffer a little block now and then. 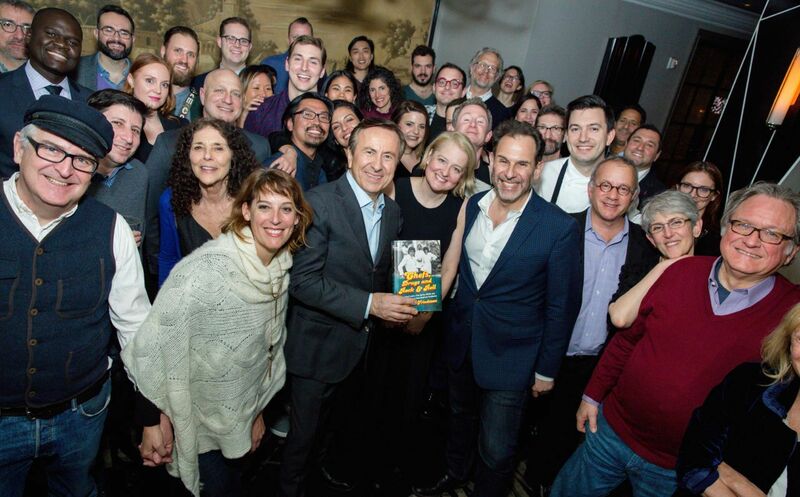 Daniel Boulud threw a party to celebrate Chefs' tell-all. Tom Colicchio left of Andrew, Daniel on right. Except for a few stylish outliers, the concentration of cooks, restaurateurs and food writers, with and without their mates, that began to gather at 9:30 Monday evening did not resemble the Upper East Siders who might normally stop in for an cocktail or a coupe of champagne at Boulud’s stylish Art Deco, black-and-white- lacquered boîte. In other words, I don’t see Jeremiah Tower, a prominent hero in the book. But never mind. It’s obvious that Friedman, signing a huge pile of giveaway books, is thrilled beyond mere mood elevators by the turnout. 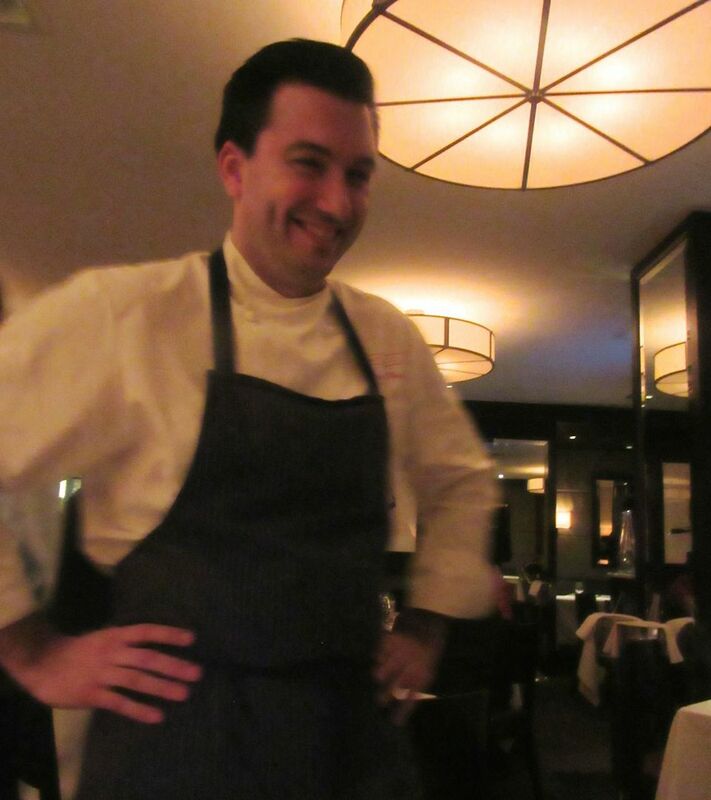 Latish at Café Boulud, they turned down the lights making this photo of chef Aaron Bludorn too dark. 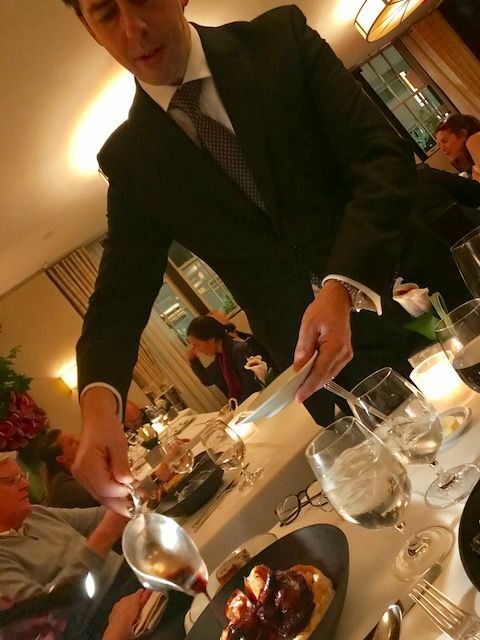 I’m usually on my way home from dinner by 9:30, but committed to a late night stop at Andrew’s party I decide it might be fun to start with dinner at Café Boulud. It had been a long time since my last visit. Friends have been raving about Aaron Bludorn, the newest chef. I tell him so, when he stops at our table just after Daniel’s signature madeleines arrive tucked into a napkin bunting. “How long have you been here?” I ask. Earlier, it was bright enough that Dana shot this great photo of Hasty Torres and Barbara Lazaroff. “Seven years,” he replies. Well, exactly. That is a long time between meals. It’s long enough, I gusss, that no one recognizes me when we arrive, reserved under another name. Well, of course Hasty Torres and Barbara Lazaroff, in an impassioned tête-à-tête at an upfront VIP table, wave hello. 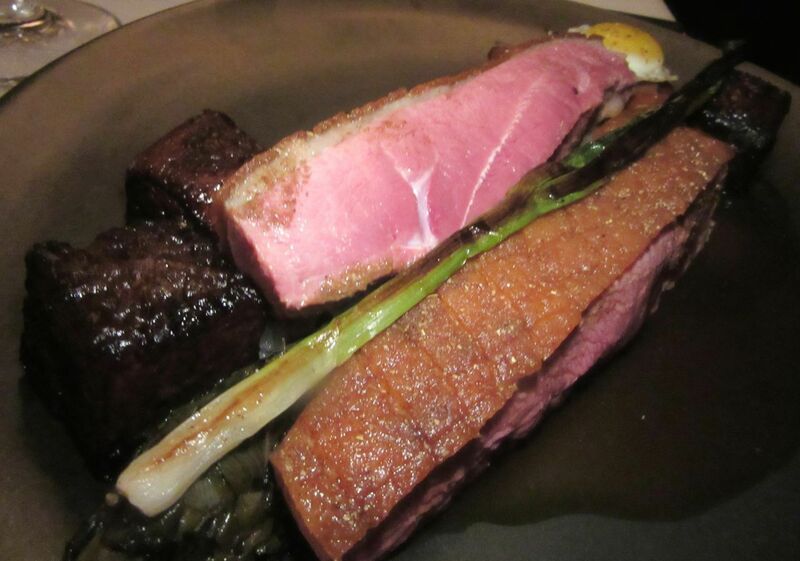 Lazaroff’s tale of early Wolfgang Puck triumphs at Spago and Chinois on Main are wonderfully indiscreet. Andrew, setting up next door, stops by to welcome them and spots my niece Dana and me. 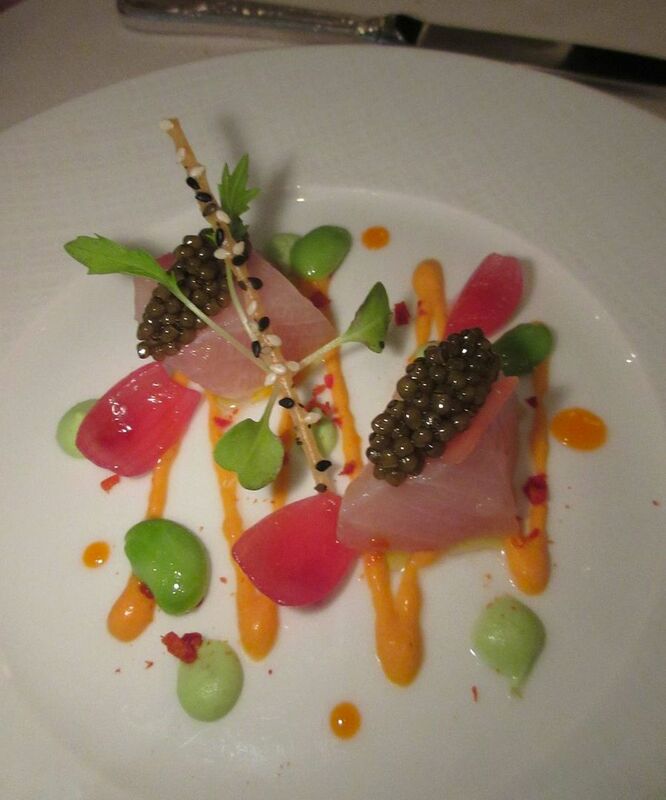 Café Boulud, like the bar, like the neighborhood, is discreet and civilized. I can’t imagine anything quite like it on the Upper West Side. It’s not as French as it once was. 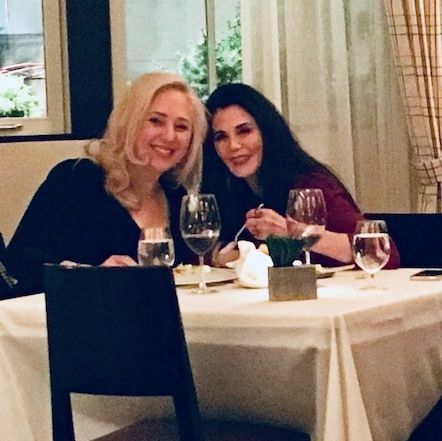 But a lot of restaurateurs got fined for being too French a few years ago, and now they look like America, full of immigrant hopefuls from the heartland and overseas. I am stunned by the huge portion of chestnut velouté but finish it anyway. I’m pleased that Boulud’s original menu theme I always liked is the same. It’s divided into four categories: La Tradition or the Classic, La Saison (winter flavors), Le Potager (inspired by the market) and Le Voyage. Tonight’s voyage is to Japan. There’s a list of daily specials too. Surely, it wasn’t quite this expensive the last time I came. First courses are $21 to $28, and entrées, $38 to $60, but mostly in the forties. That’s not totally surprising. High prices spook me now everywhere. 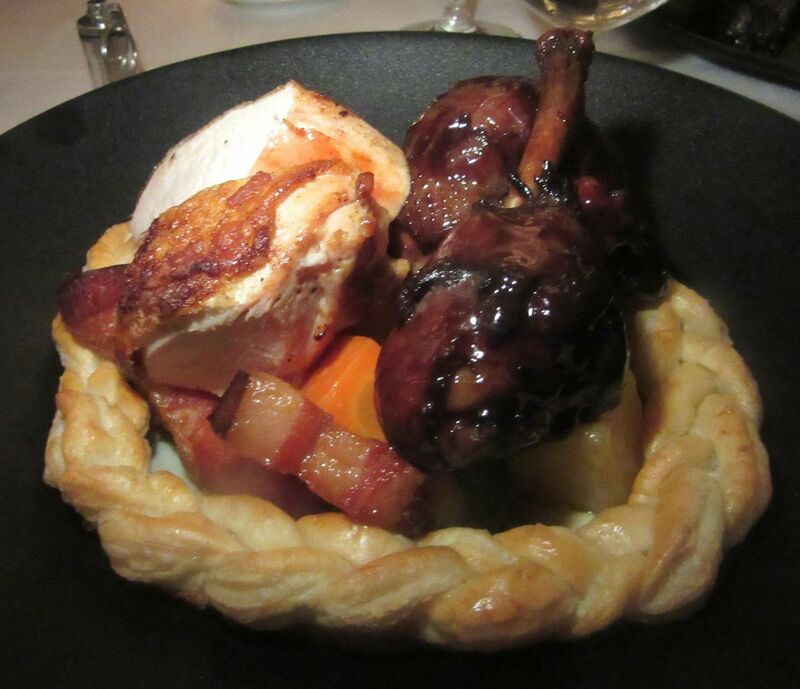 Dana Stoddard tilts her camera (with apologies) to capture the waiter sauceing my coq au vin. 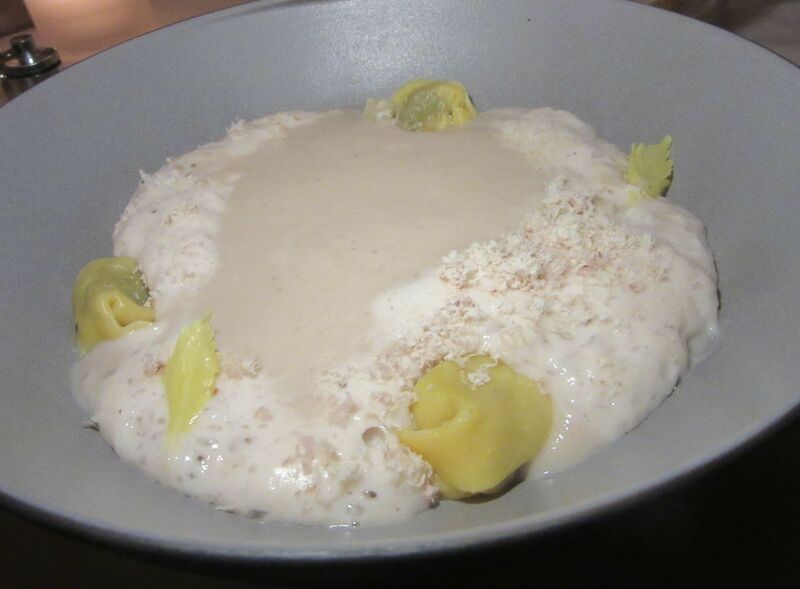 As soon as I spy the chestnut velouté in the Traditional Classics, I know that’s what I want. Chestnut velouté with foie gras, Madeira cream and celery root as a starter. It makes everything else, except perhaps the escargot in vol-au-vent, seem too familiar. Peekytoe crab and Icelandic cod are offerings I can have almost anywhere these days. The coq au vin is the best I can remember in ages and beautiful too. I love that pastry braid. I’ll have the coq au vin, too. Clearly, it’s hard to do a really fine coq au vin. Almost all I’ve had recently are dried out. Bludorn’s extraordinary still life with its pastry braid encircling the plate defies the usual cliché. The leg comes painted with concentrated red wine goodness. The bacon lardons are big and meaty. Only the white meat suffers from the usual over-cooking. But the velouté is probably too thrilling – a huge bowl, filled nearly to the brim, with waves of cream afloat. So much. So wonderful. The foie gras is inside the little dumplings. I can’t believe, I’m eating it all. 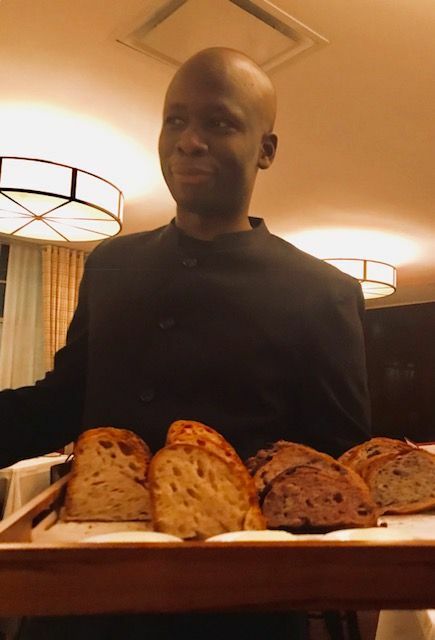 The bread server keeps returning, determined to get Dana to taste more of his bread assortment. The bread server offers a choice of walnut-raisin, olive-rosemary ciabatta, and rustic sourdough. I love bread. I love bread too much. Dana takes one slice and doesn’t finish it. I take two, and yes, they disappear. I insisted on rare duck and that meant we needed a steak knife to cut it. But we were both to full to finish. 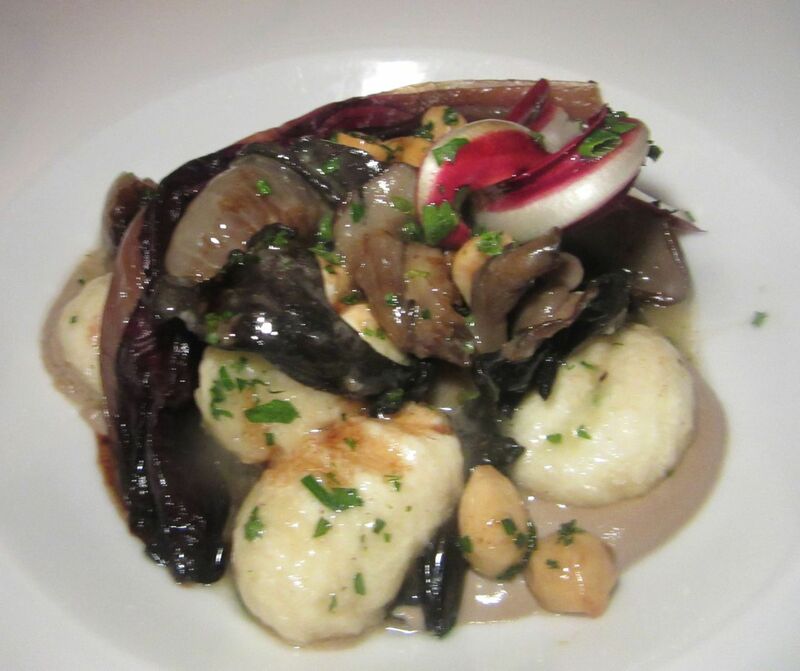 I taste her ricotta gnocchi starter, with wild mushrooms and its sharp touch of hazelnut balsamic vinegar. I need to taste her crispy duck breast with umeboshi plum too. We’ve asked for it medium rare to rare and it needs a steak knife to saw it. Huge squares of daikon are coated with sweet sauce And it’s not just any rice underneath, but koshihikari rice. That’s also wonderful. At first the bread bearer seems determined to get Dana to take another slice. He keeps returning to the table pushing his crusty offerings. Are we a challenge? He comes back so often I wonder if he has a quota or feels threatened by Dana’s indifference. 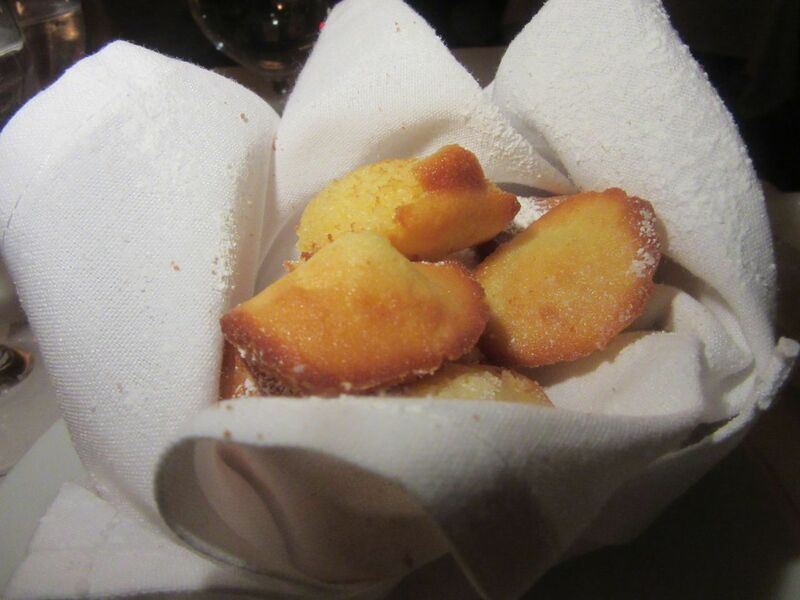 Even if you skip dessert, the kitchen will send classic shell-shaped madeleines sprinkled with sugar. At this point neither of us can make a dent in our entrées. I hadn’t expected portions to be so huge. Do well-bred Upper East Siders take leftovers home? Daniel’s signature warm madeleine’s arrive with confectioner’s sugar sprinkled all over the wrap. I persuade Dana to try one. Then comes a duo of chocolate truffles. I take a bite. Across the hall at Bar Pleiades, Daniel and Drew Nieporent join Hasty and Barbara with gift books. We check our leftovers with the cloakroom and are first to arrive at Bar Pleiades. Soon the earliest arrivals are clustered in a crowded huddle opposite the bar. Dorothy and Jerry Kretchmer. Michael Whiteman and Rozanne Gold. I sit down next to Gerry Dawes, reminding him of our Tapas Crawl. “Shouldn’t we do it again?” I ask. Drew Nieporent collapses to my right. Barry Wine, (see Nouvelle Notions and Naïveté), has wandered to the far rear where the kitchen crew has set up supper in large chafing dishes. 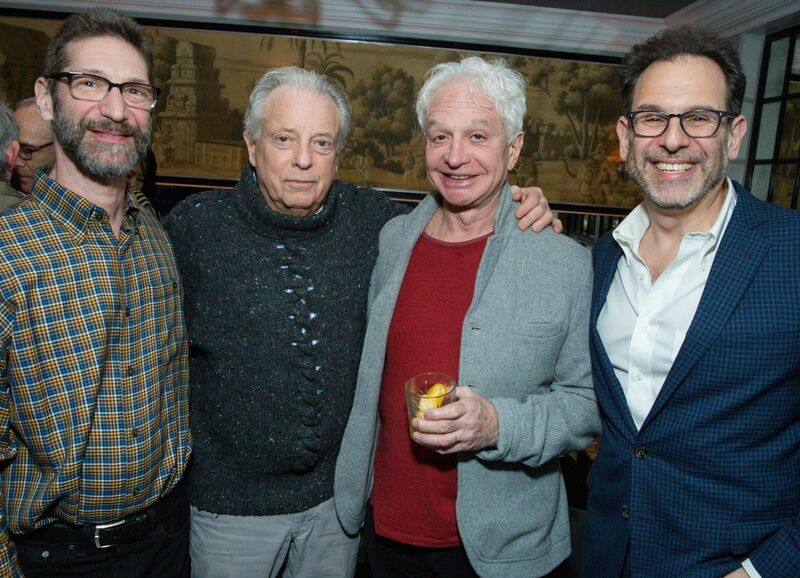 Andrew w. Chanterelle’s David Waltuck, Dodin Bouffant’s Bob Pritsker & Barry Wine of Quilted Giraffe. Bob Pritsker falls to his knees in front of me. Friedman has written about five self-taught American couples gathering stars who opened in Manhattan at the end of 1979. I called it Cuisine from a Marriage. I haven’t seen Pritsker since he closed his place and moved to Connecticut with a new wife and twin babies. 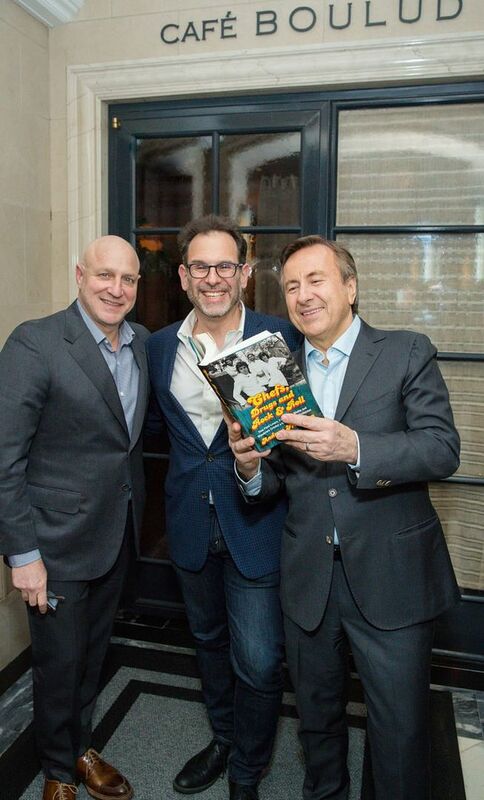 Andrew Friedman co-authored book with Gotham Bar & Grill’s star chef-owner Alfred Portale. 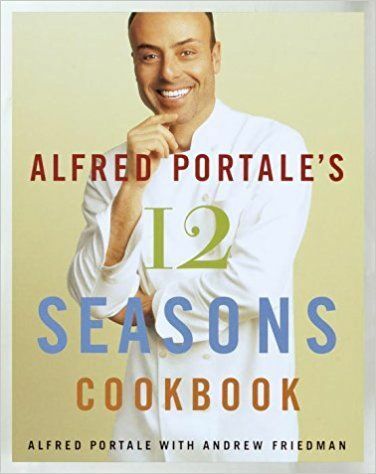 Alfred Portale says hello reminding me it was Jonathan Waxman who suggested to Kretchmer that Alfred would be the chef to save Gotham Bar & Grill when it was foundering in 1985. I was the first to write about Portale’s luster and the Times followed quickly awarding three stars for Gotham. So many memories crowd into Andrew’s party. We leave early toting books signed by Andrew with a very thick Sharpie. Jeremiah Tower, the Last Magnificent, a major player in the book, missed the party. To me the work seems too tilted to the West Coast. 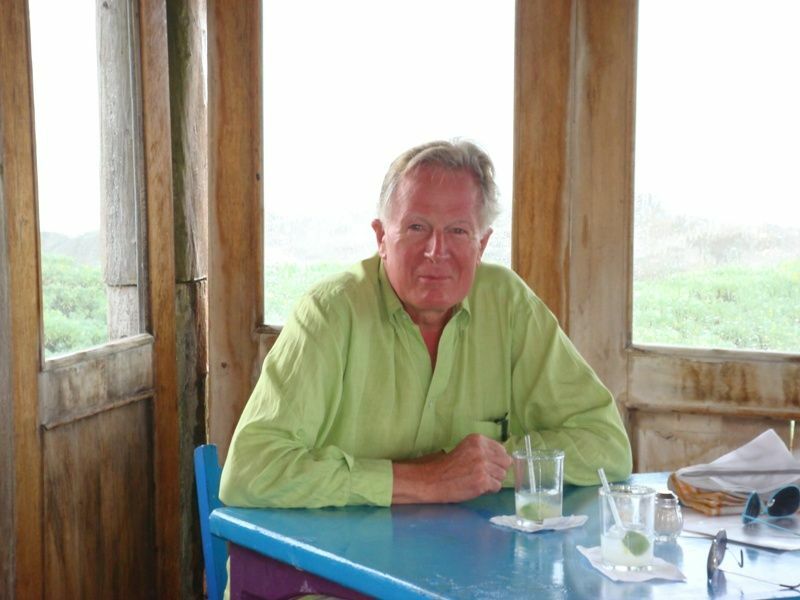 Jeremiah Tower has always claimed he taught Alice Waters to buy a respectable green bean. That the recent documentary about Jeremiah Tower is called The Last Magnificent says it all. Tower seems caught up in that image. And maybe his disciples are too. But I wasn’t there. I was in Manhattan in the ‘60s and 70s, studying Henri Soulé, Lutèce and The Four Seasons. You don’t have to be a star or a supporting player in Friedman’s collection to savor Chef’s, Drugs and Rock & Roll. Whether you were a food fan early on or are a born-too-late foodie to have tasted it all, you’ll be fascinated hearing the history through the voices of those who were there. The indexes of interviews and sources confirm Friedman’s obsession with the chase. A must read, yes, and not just because I’m so fond of Andrew. 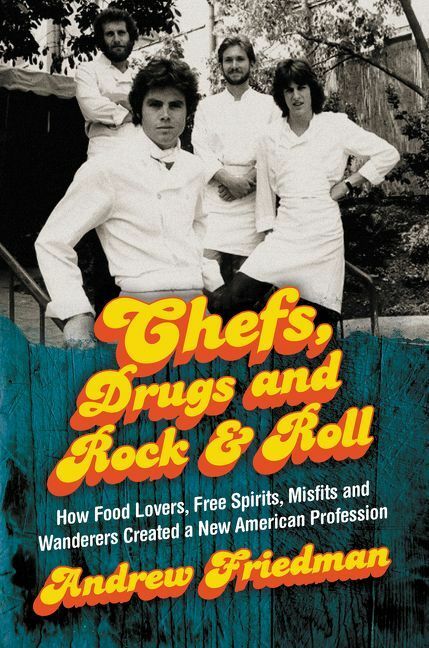 Chefs, Drug and Rock & Roll: How Food Lovers, Free Spirits, Misfits and Wanderers Created a New American Profession. By Andrew Friedman. Ecco $27.99.